Candice Patton had accidentally shared an on-set photo, almost confirming Vibe's death. To ensure that the buzz around The Flash is steadily growing until season 5 premiere, the makers have been releasing information in a controlled manner. After a brief glimpse into the speedster's new superhero suit, the creators of the show have released titles to the episodes releasing in the coming season. And it's not good news. Here are the titles: Episode 01 - Nora; episode 02 - Blocked; episode 03 - The Death of Vibe; episode 04 - News Flash; episode 05 - All Doll'd Up and episode 06 - The Icicle Cometh. 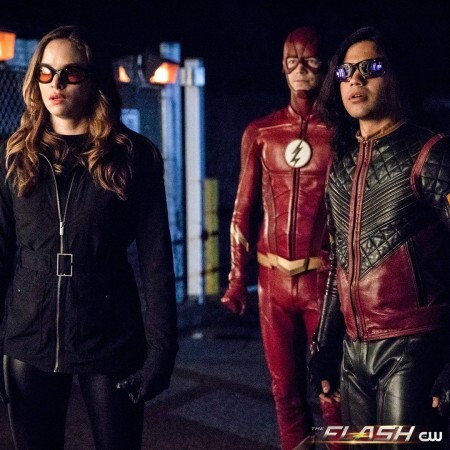 Episode three and six are definite trouble to the extent that the characters in question – Vibe (Carlos Valdes) and Killer Frost (Danielle Panabaker) – might be killed off. Although, Killer Frost's fate is hard to determine, Vibe may not be sticking around for long. Earlier this month, Candice Patton (Iris West) had accidentally shared an onset photo on her Instagram story that had a picture of Vibe in the background and it read "VIBE DEA." And we all know how that word could end. Soon after the picture went viral, the actress took it down from her account. However, we'd like to look at the positive. A quick recap of Season 4 will tell you that after the original Breacher retired, he offered his position to Vibe. He knew this would affect the team dynamics and therefore put the idea on backburner. But, will he finally take it up? Episode 5 – All Doll'd up – could be about the Rag Doll villain everyone's talking about. In the comics, Peter Merkel (alter ego of Rag Doll) was born with a condition, which allowed him bent his body in directions that are humanly impossible. Apparently, the team has put out a casting call, in which they are specifically looking for a "twenty-something" to play the role. Cicada, King Shark and Grodd are the other villains the Flash will be fighting in the coming season. Episode 1 – Nora – will pick up from where it left – Barry Allen (Grant Gustin) and Iris trying to process the information that had just been dropped on them. The surprise on their faces when they learned about their future daughter, Nora (Jessica Parker Kennedy), will be explored further. The Flash Season 5 will return to TV screens on October 9.